2018 Rocky Mountain Dental Convention - Mark T. Albers, D.D.S. 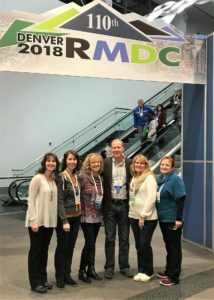 On Thursday and Friday of last week, the staff and I attended the 2018 Rocky Mountain Dental Convention (Jane and Judy also stayed in Denver to attend the Saturday sessions). We try to attend this conference every year as it offers classes on a variety of issues related to dentistry. And, a large exhibition hall features vendors of everything from handpieces to 3D Panoramic Digital X-Ray units, to toothpaste. As a group, we try to hit different classes so that we can compare notes later. I asked the staff to provide thoughts about their favorite classes this year, and summaries are provided below. Jane and Judy texted their thoughts on favorite classes after they finished on Saturday. Consequently, their highlights are longer than the favorites from the rest of the staff. They’re so good, though, we’ve included most of what they wrote. Jane: It is really hard to pick my favorite continuing education class this year since they were all so good. The highlights were in my nutrition and pharmacology class. We learned the importance of knowing what prescription drugs and over the counter medications our patients are taking. It’s even important to know what vitamins patients take. We learned about recognizing signs of vitamin deficiencies and also learned that since some symptoms overlap, proper diagnosis can sometimes be difficult. Another class on keeping up with the cutting edge of periodontics provided guidance on when to refer a patient for surgery or a patented laser treatment called LANAP. Finally, I enjoyed a class on how food choices impact our health and our family’s health. It was a real eye opener on where health of the U.S. population is headed if smarter eating choices are not made. The speaker provided practical information on how to involve our patients in making the right choices for themselves. Judy: My favorite class addressed how nutrition and pharmacology can affect not only oral health, but overall health. The most intriguing information was the manifestation of symptoms resulting from a deficiency of vitamins orally and systemically. The class also addressed how different prescription medications contribute to these symptoms. Michele: My favorite class covered the best kept secrets of successful practices and tips on helping patients have a good experience at the dental office. Our office values close, long-term relationships with many of our patients and we appreciate feedback and reviews of all kinds. This class confirmed that we are doing many things well, but also gave me ideas on improving the experience of patients when they come to our office. Susan: While a class on forensic dentistry was very interesting, the class with the most practical information was on the different types of dry mouth – a serious condition that can affect oral health. Saliva cleanses and bathes the teeth throughout the day. It also has buffering capacity to neutralize and counteract the acids in different foods. When the mouth is not producing enough saliva, patients can have an increased incident of decay. We see this sometimes as a side effect of medications. We learned about different ways to educate patients about the causes and complications of dry mouth. Lee Ann: The most interesting course I took covered a new type of dental implant. The class instructor was the doctor who developed it. We learned the history of this implant, including the legal challenges in developing it. Dr. Albers: I took a course on planning and treatment of dental conditions using 3D imaging technology. We are going to be adding this technology at the office in the very near future. The class clarified how it will aid in the treatment and diagnosis of dental conditions.